+rep very trusthworthy, polite and patient! +Rep! Legit trader and amazing! +rep I Buy Ori and the Blind Forest . All ok.
+rep traded Flinthook for money, all went through fine :D Recommenced trader very friendly. I had agreed to make a trade with this user, even though the trade WAS clearly to his favor (warhammer: 40,000 steam key, a game easily obtained for less than $2) but I wanted it quickly so I offered one key and 14 ref. I agreed to go first because being new, I have less rep (I was going to send my 1 key and 14 ref as a gift, he wasn't going to send the game until AFTER he received my items). However, when I made the trade offer I noticed it said on the page there is a 2 day hold (which is unusual since my account is mobile authenticated). I suspect the hold was due to his account having a VAC ban on his record (by the way, my account is clean, I have never had any type of bans). I did NOT want my items to be on hold and have to wait 2 days to receive the game but I DID want to do the trade but he mentioned he needed to go. I did NOT want to rush into anything so I told him I would figure out the trade hold (to see if it was on my account and if so, why) and contact him later to do the trade. Then he tried to pressure me into doing the trade even though he too had seen the 2 day hold. By the way, keep in mind, I said "let's do the trade later" and never asked him for his game because I had agreed to go first, yet when he left me negative rep he suggests that I wanted to get his game and then cancel the trade. The reason I told him I wanted to clear the hold later was to AVOID being in a situation where either one of us had to wait for 2 whole days for the trade to finalize. So that makes it clear that I was NOT trying to get his game for free because I cancelled the trade BEFORE he gave me the game. Anyway, I still had every intention of doing this trade but then he started being very rude, accusing me of scamming him (if anything, it is very possible he was trying to scam me, I was just protecting myself). I apologized for wasting his time, he said he was going to report me which I told him to go ahead because I did nothing wrong. I don't mind being reported but it is VERY OBVIOUS this steam user is extremely childish and temperamental and he got upset because I gave him a good offer and then he thought I changed my mind. Although there were red flags (such as the fact that he already had 1 negative rep, 1 vac ban in his account, and his prices were higher than most) I was willing to work things out with him but his response was to insult me and threaten me. Anyways, BUYER BEWARE! Do NOT trust this person, it will be a big waste of time and very dishonest and childish. Now that I have reported this person, I am never dealing with them again, good riddance. EDIT: This person claims I tried to pay them with PayPal and the payment did not go through. This is not true. No paypal attempt was EVER made because the user disclosed they do not accept PayPal at the beginning of the transaction. This person is actively trying to ruin my reputation. and such as by first claiming my PayPal was declined and then admitting it didn't happen (but that he only said it did since he ASSUMED it would ended up in a scam) and he even went as far as involving someone else who has NOTHING to do with it, defaming them in the process. I don't want anyone to have this experience, it is very unpleasant. "WARNING! PAYPAL SCAM ATTEMPT, THAN AFTER DECLINED PAYPAL THIS USER HAS A 2 DAY TRADE HOLD AND TRIES TO BUY GAMES WITH KEYS & METAL AND HAS NO PROBLEM GOING FIRST, BECAUSE AFTER THE TRADE IS MADE HE WILL CANCEL THE PAYMENT TRADE OFFER AND RUN OFF WITH YOUR GAMES! I was smart enough not to fall for it, but he tried. 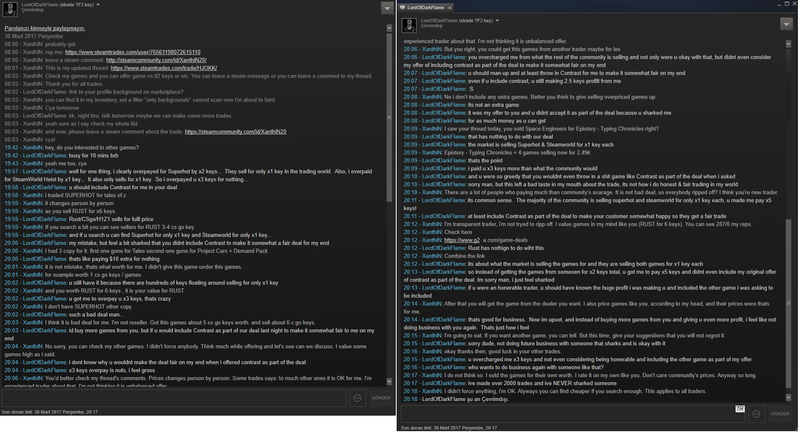 Also, this is a smurf account of many Steam accounts that he has that ive tracked him on through Valve. Trade at your own risk!" 1) You offered paypal which would have ended up a paypal scam. 2) I MYSELF NOTICED the 2 day trade hold on YOUR account as its a smurf account on Steam. 3) After I pointed out your trade hold you canceled the trade offer and ran. You got caught on a scam attempt using multiple smurf accounts, you got busted, deal with it! Posted here so innocent people are warned of your ways before attempting to 'trade' with you. -REP unstable and grouchy trader. You should keep back if you don't want any trouble in future! He leaved a negative rep for nothing and community appealed it. I didn't force him to do anything. He offered and i accepted, that's it! The next day he said "i found a better deal after we done, include the remained game for free!". Surely I refused, why should I? Everbody can find a better price if search enough, that was not my mistake and it isn't gulling. Prices can change trader by trader so i price my games in my own way, like him. Check his prices of his tradables, he asking overprices for them so is he trying to rip off?.. He is such a unstable trader and accused my flawless profile with fraud. Found out the next day that he sharked me out an extra x2 TF2 keys for one game and another x1 TF2 keys for another game vs what the rest of the community was selling for. Didn't include another crap game that I asked to be included as part of my GENEROUS total x7 TF2 key original offer in order to try and shark me out of as much profit as he could. Was my first day as part of the community, and was my fault for approving the trade, but ripping people off is not how I treat my customers. He wanted me to buy more games from him, but I refuse to give future business to someone that sharks people. He posted a negative rep on this profile in rep-revenge after I left a negative review on his profile based on my horrible exp with this guy. Ive had members contact me that he's also been begging users that he has contact with to downvote this Vote, which later got removed on his homepage.